The Fellowes Powershred Shredder is certainly an interesting product. It is sitting at 3.9 stars on Amazon, however there are a number of critical reviews of the product. But instead of only listening to others opinions of the product, why not take a look at what is actually inside this device and make up your own mind. The Fellowes Powershred Shredder is a cross-cut design with an 11 sheet paper capacity. These guys take strip shredders one step further and cut them either across or diagonally. You will end up with either little squares or diamond shaped pieces of paper left over. The shredding size can range from 3/8" to 1/32" wide, in varying lengths. Of course, the smaller the size the better, from a security standpoint. These are widely available and the most popular type of shredder. Best for small business or personal use. It also has a security level of P-4. Level 4 is when you need to get rid of financial records or other highly sensitive information. The size of these cuts tend to measure 1/16" x 5/8". To catch the shreds of paper, this shredder has a 4.75 gallon collection bin. This is actually on the smaller side when compared to other cross cut shredders, which typically have a 5.5 gallon or larger. It also has a decent continuous run time of 5 minutes. However the cool down time is 20 minutes, which is a bit longer. However, all of this is pretty good when looking at the size of the product. It is a bit larger than some others, but still compact enough to not take up a lot of space in your personal office. It sizes in at 17.75 x 13.75 x 9.25 inches. Not too big, but a tad bulkier than some others we have seen. Unfortunately, there are not a whole lot of features for the Fellowes Powershred Shredder. However, the ones it does have are pretty great. One very unique feature is the waste bin. It doubles as a trash can that you can dispose of non-confidential documents. There is a slot right in the front for you to simply slide in whatever you need to throw away. Now this does occupy the same space as the shredded paper, so there may be a need to empty the bin a bit more often if you continuously use the trash can feature. To empty the bin, Fellowes actually placed a handle on the top of the shredder. Just remove the top and either dump the bin or remove the bag. While I personally do not like the top removal design, the handle is a nice addition and makes it safer for the user. By far the best feature of this device is the safety lock. There is a big slider on the shredder that you can switch to lock or unlock. When it is in the locked position, the shredder will not run at all. To get the shredder running, you will need to switch it to unlock. This is a wonderful feature that is much needed if you have pets or children in the vicinity of the shredder. as they both like to play with everything in sight. However, this switch may come more as a disadvantage and general annoyance if you are using this in an office setting instead of at your home. The whole product is backed by a 1 year warranty and a 3 year warranty for the cutters. While there is no company story, it is clear to see that Fellowes is an office accessory company. Their product line includes everything from shredders to air purifiers. The company Fellowes also has 4 brands under their belt. They include their name brand Fellowes, Bankers Box, Aera Max, and Body Glove. Their products are sold through national office products suppliers and local dealers, along with countless retailers from coast to coast. However, since we are reviewing their powershred product, it is worth mentioning their other shredders as well. They make available a number of different styles of shredders, all ranging in design, size, and security level. They have shredders for households, small office, commercial, autofeed, government approved, and numerous accessories. The Fellowes Powershred Shredder has a standard cross cut design, but paired with a great security level. P-4 level security takes the standard cross cut one step further by making the shred even more precise. The only security level higher than 4 is used by government offices and hospitals. The dual use collection bin is very unique. In fact, I have never seen this before. 4.75 gallon bin that doubles as a trash bin for non-confidential waste. While it may prove to be a bit more of an annoyance, it is still a nice addition. 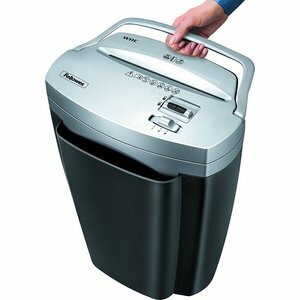 While the waste removal design is not my favorite, Fellowes Powershred Shredder does ensure user safety by adding a handle on the top. This way, you can use the handle to remove the top and not have to worry about it falling or losing control of it. Last thing you want is the top of a plugged in shredder falling on your feet. By far the best design choice with this shredder is the safety lock. This allows you to securely lock the shredder, not allowing it to run, even when paper is inserted. This could prevent any unfortunate accidents with rowdy kids or curious pets. While it does not support multimedia shredding, it does support credit card shredding. So you can still securely dispose of those old or unwanted credit cards. There have been many critical reports surrounding the Fellowes Powershred Shredder. The most common complaint is that the device is poorly designed and poorly made because it either burns out quickly, or breaks easily. Some of the features of this shredder could end up being pointless, depending on the area it is used. The safety lock would be virtually pointless in an office setting. The dual use waste bin would result in more time emptying the bin as it would be a shared space between regular trash and shredded paper. While this shredder is honestly nothing special, it seems like a decent enough product that will get the work done it needs to. However, the lack of features like casters and multimedia shredding, really puts limits on the device. And while I can not personally speak of the build quality because I do not have the shredder in my possession, many others have complained that the quality is very low. But if you are looking for a bargain shredder that will still, most likely, work for a while, than this is the product for you. Overall, the Fellowes Powershred Shredder is a rather basic product. The best thing it has got going for it are its safety features. Nevertheless, if you want to grab one for yourself, you can find it on Amazon for $58.98. For any other information, including the best paper shredders, head on back to Green and Growing. Here are some top questions that I found for people seriously considering buying the Fellowes Powershred Shredder. Can this shred through staples? It seems to handle staples and paperclip just fine. Can it handle standard junkmail? It should handle it fine. Just be sure the envelope is not too large. How loud is this shredder? It does run rather loud, around 72 decibels.